There Is vs. There Are: How to Choose? The choice between the phrases there is and there are at the beginning of a sentence is determined by the noun that follows it. Use there is when the noun is singular (“There is a cat”). 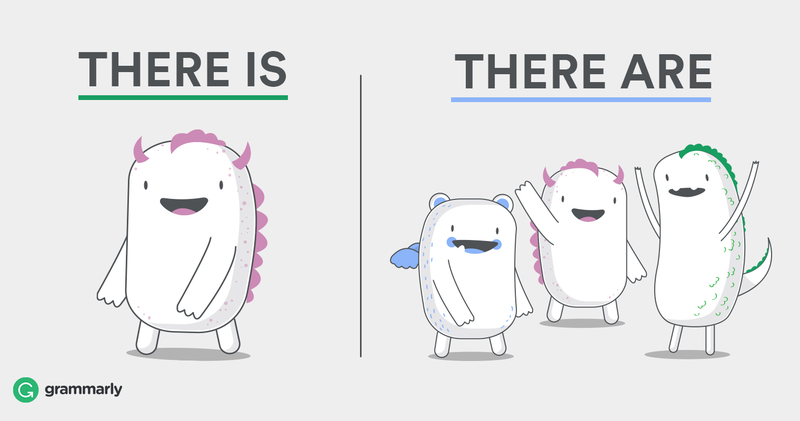 Use there are when the noun is plural (“There are two cats”). You probably know that the choice between is vs. are depends on a noun. In most sentences, the noun comes before the verb. But in sentences that begin with there is and there are, the noun comes later. There is a cat on the porch. In the sentence above, cat is singular, so it requires there is. There are many opportunities to learn at this company. There are a number of unnamed stars in our galaxy? There is a number of unnamed stars in our galaxy? It’s difficult to tease out whether you should use is or are in a construction like this. The verb is being pulled toward there, number, and stars all at once. Here’s a tip: Sentences that begin with There is/are a number of… are almost always wordier than they need to be. Your best bet is to rewrite it: Many stars in our galaxy are unnamed. But if you really can’t rewrite it, you’ll have to make a choice. Use is if you want to emphasize the group; use are if you want to emphasize the individual members. It’s the same with other collecting phrases, like a variety of. There is a wide variety of flavors to choose from. There are a variety of unique destinations we can visit. Use there are when you’re talking about “a lot” of something. There are a lot of people in this elevator. There is a lot of people in this elevator. There are a kitchen, a living room, and a bedroom in my apartment. There are sounds bad because the noun that follows it, kitchen, is singular. Even though you’re really talking about multiple things, (a kitchen, a living room, a bedroom), it’s often better to use the singular verb is in a construction like this. There is a kitchen, a living room, and a bedroom in my apartment. Some language commentators still insist on using are in sentences like this despite the awkwardness, but actual usage is extremely mixed. Remember, if the sentence sounds awkward either way, you can always rewrite it to avoid the “there is/are” problem altogether.